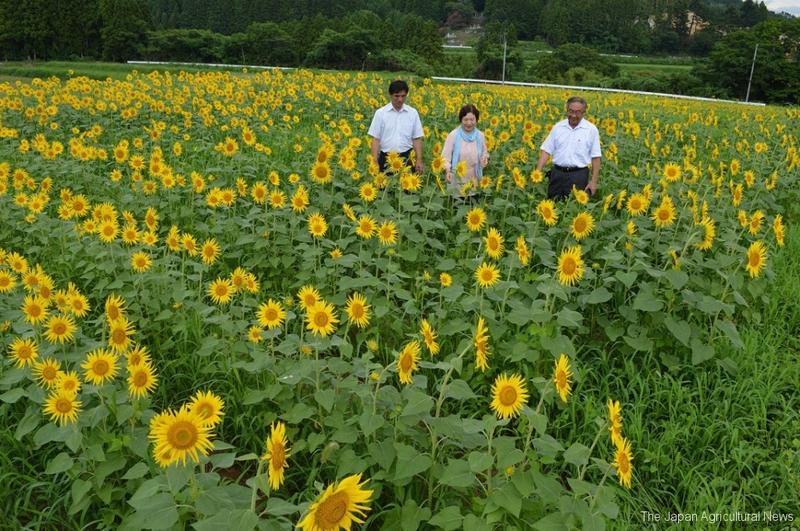 Tomoko Nemoto (center) and members of the Okuma town sunflower project speak about future activity plans at a sunflower field in Okuma, Fukushima Prefecture. FUKUSHIMA, Aug. 29 – Sunflowers are in full bloom in the town of Okuma, Fukushima Prefecture, where all the residents have been unable to return after the Fukushima No. 1 nuclear power plant accident brought about by the 2011 earthquake and tsunami. A group of 50 residents sowed the seeds on a 1.8-hectare land in June in an effort to maintain the weakening ties between the town and the evacuated residents, as more than seven years have passed since the Great East Japan Earthquake. The yellow flowers fill the fields besides a street in the town’s Ogawara district where people drive on to return to their homes temporarily. A message “Okaeri,” meaning “welcome home” in Japanese, made of blue plastic sheets is seen on an embankment behind the flowers. The town, which hosts the power plant, has been under evacuation orders since March 2011. The municipal government functions were moved to the cities of Aizuwakamatsu and Iwaki in the prefecture, and residents were evacuated to places in and out of the prefecture. Some resident volunteers began the activities of growing sunflowers in 2011, first in the prefecture’s Aizu region where they were evacuated. Since 2014, after the no-entry order for the town was partially lifted, they have been sowing seeds in the rice paddies in Ogawara. Their activities are also aimed at preserving farmlands, as decontamination is completed in farmlands except in areas where entry is restricted. In December last year, they launched the Okuma town sunflower project and recruited participants for seed sowing through the town’s brochure.